Description: How does performing affect those who perform? Starting from observation of the intergenerational tradition of performing the Song of Moses (Deuteronomy 32.1�43), Keith Stone explores ways in which the Song contributes to Deuteronomy�s educational program through the dynamics of reenactment that operate in traditions of performance. Performers of the Song are transformed as they reenact not only characters within the Song but also those who came before them in the history of the Song�s performance―particularly YHWH and Moses, whom Deuteronomy depicts as that tradition�s founders. In support of this thesis, Stone provides a close reading of the text of the Song as preserved in Deuteronomy and as informed by the account of its origins and subsequent history. He examines how the persona of the performer interacts with these reenacted personas in the moment of performance. He also argues that the various composers of Deuteronomy themselves participated in the tradition of performing the Song, citing examples throughout the book in which certain elements originally found in the Song have been adopted, elaborated, acted out, or simply mimicked. Citation: Don C. Benjamin, review of Keith A. 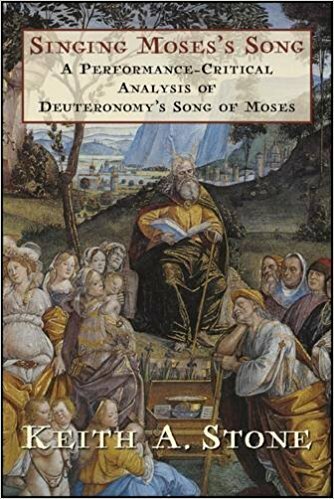 Stone, Singing Moses� Song: A Performance-Critical Analysis of Deuteronomy�s Song of Moses, Review of Biblical Literature [http://www.bookreviews.org] (2017).